To answer your question, Tom is an influential leader within JCAA and his opinions are respected. However, he does not set policy. That is done by the clubs as I explained. Tom agrees with the position of the JCAA most of the time. However, he represents all of the fishermen of our state and usually does what the majority of people want as discussed at various hearings. Also, as the Governor's appointee, Tom has to comply with the Governor's directives on any particular issue. For instance Tom has always favored the conservation on menhaden but was ordered by Governor Christie not to argue for conservation but to side with the southern states to and the commercial fishermen there so that they could further exploit the resource. That occurred because of Governor Christie's close affiliation with the Virginia governor when Christie was running for president. All the JCAA member clubs support Tom and believe he has done a great job representing us on the commission. Unfortunately, there is a lot of misinformation about Tom on the internet. He will be at the meeting so please come and you will have an opportunity to talk to him. This will most likely be Tom's last term on the ASMFC so we will need a qualified person to replace him. Also, a lot of people don't realize this but the JCAA was chiefly responsible for making striped bass a no-sale or gamefish in NJ. Tom was the one who was lobbying the legislators to do that. There is a lot more I can fill you in about striper management at the meeting and I am going to also post a letter from Tom about this issue. I would support a higher size limit and/or establishing seasons. However, the commercial guys would also have to cut back by the same percentage. Thank you, and you are welcome to come regardless of how you feel about Tom. Please realize that he is a member of JCAA but neither he or any other board members establish positions for JCAA on any issue. We are an association of clubs and each club has an equal say and then our positions are formed by how our member clubs vote. Also,Tom does not represent JCAA on the ASMFC. He is the Governor's appointee and he is charged with representing all of New Jersey's fishermen, not just those who belong to JCAA. Yes, Tom is our legislative committee chairman. All, Please just respond to this thread if you would like to attend. We will be serving pizza beginning at 7 PM. Thanks, Paul Haertel JCAA Membership Secretary The Jersey Coast Anglers Association is seeking new member clubs as well as associate (individual) members. For the first time ever, JCAA is opening its a general membership meeting to those who may be interested in joining or learning more about how JCAA operates. The meeting will be held at 7:30 PM on 2/26/19 at the Jersey Coast Shark Anglers Club located at 385 Herbertsville Rd., Brick, NJ. Annual dues for club membership are $50 while associate memberships cost $25. Light refreshments will be served beginning at 7 PM. Seating is limited and we also want to order the appropriate amount of food so please contact our membership secretary, Paul Haertel at 973-943-8201 or anglerpmh@aol.com if you plan on attending. The Jersey Coast Anglers Association is a charitable non-profit 501(c)3 organization that was formed in 1981. The original objective of the JCAA, that continues today, was to combine a group of marine sportfishing clubs in order to form and promote a united consensus on issues relevant to saltwater anglers in New Jersey. Amongst the topics likely to be discussed at this meeting are the recently signed Modern Fishing Act, the proposed windmills off our coast, sand mining, the new striped bass stock assessment, forage species, youth education activities, and what our regulations might look like this year for fluke, sea bass, stripers and perhaps other species. Before the site would not let me copy and paste further information that further explained the JCAA and NJOA position on this. However, below is a similar letter that I wrote for the Forked River Tuna Club: I am writing this letter on behalf of the Forked River Tuna Club which is composed of more than 100 members and is based in Forked River, NJ. We appreciate this opportunity to comment on the amendment that is currently being developed by the ASMFC and the MAFMC regarding the Bluefish Fishery Management Plan. Our primary concern is that this amendment may contain an option that would revise the allocation of bluefish between the commercial and recreational fishermen. More specially we are opposed to any option that would grant the commercial sector a higher percentage of the quota than they have now. The split is currently 83%-17% favoring the recreational sector and we want it to remain that way. Further, we are opposed to the transfers of recreational quota to the commercial sector that have been taking place for the last number of years and we urge you to immediately stop that practice. 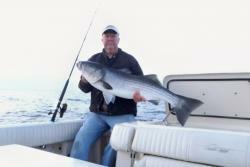 The recreational fishermen have been under fishing their bluefish quota for a number of years. That is not a good reason to transfer some of their quota to the commercial sector. We want to rebuild the stock not reduce it. Bluefish are a very important fish for inshore and shore-based fishermen. There used to be massive runs of bluefish of all sizes in the NJ surf during spring and fall. During summer these fish used to settle in areas such as the Mud Hole and Barnegat Ridge and provided sport and food for the many private, charter and party boats that depended on them. Many of those boats have now gone out of business or have been forced to target other species. Striped bass are on the decline and there are virtually no weakfish around. It is quite difficult for shore-based anglers to catch a legal sized blackfish, fluke or sea bass and when they do, the season is often closed! Snappers are often a fun fish for children to catch from the docks and bay shore when they are first learning how to fish. We need this species to be rebuilt. Further, we are outraged at the fact that the spawning stock biomass is below its target and yet he ASMFC and MAFMC are considering transferring the some of the quota to the commercial side to ensure that they are killed. Also, in recent years the recreational harvest has dropped by about 50% compared to what is was during the first decade of the 2000’s. We are facing shorter seasons, smaller bag limits and higher size limits for sea bass, a stock that is rebuilt to 230% and the ASMFC and the MAFMC want us to believe that our regulations won’t become more stringent if we transfer some of our bluefish quota to the commercial sector? How about reallocating some of their quota for fluke and sea bass to the recreational side?